New Netcast / Podcast and website and forums and…. Don’t Pee on Your Sister! After my river dive of a few weeks ago I realized I really needed to have my own dive flag. Sure I dove with my buddy Jim and he had a dive flag, but what made me want to get one was how great it was for reconnecting if we got separated. A quick pop to the surface and I knew exactly where he was. Yes, I am sure it is much better to not get separated, but with strong current and less than 6’ of visibility it is going to happen. After looking at the commercial rigs other divers had I thought I could make one just as well myself. I like building and creating things. I get a great understanding of how they work and I can modify them to meet my specific needs. 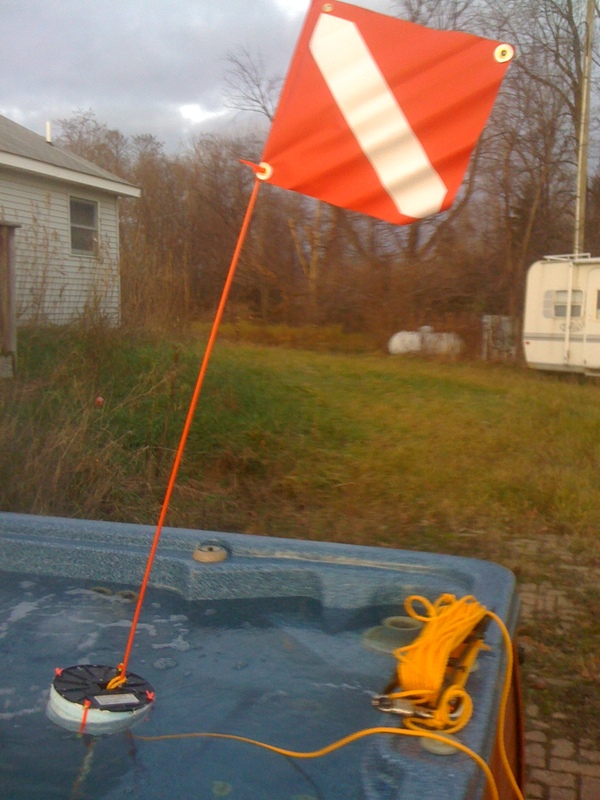 I expect before I am done I will have made several dive flag rigs. I wanted a small rig for river dives. It will mostly be use for marking my location and I want it to be a light tow. Now along with liking to have something that fits my specific needs I also like to be cheap. Any money I save just means I have more to buy air fills. I searched around to see what parts I had. 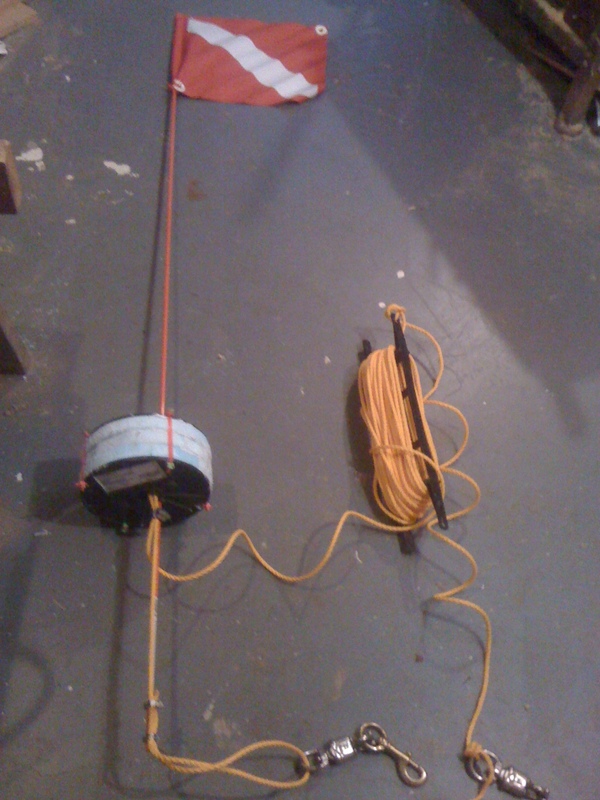 I had a fiber glass electric fence post, some 1” blue Styrofoam insulation panels, bicycle inner tubes, hose clamps, a Christmas tree light storage reel and a variety of connecting hardware. I also had some white fabric for the flag. The post looked a little short but was still taller than some of the other dive flags I have seen, so I was sure I could make that work. I didn’t have any suitable cord or rope so I would need to buy that. 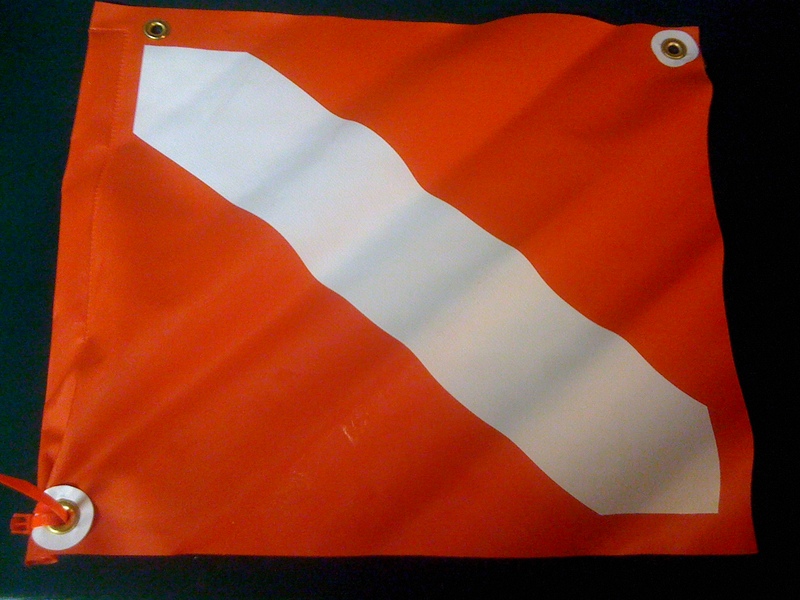 After a discussion with my wife we decided that the cost of red fabric would probably cost more than a flag from the dive store. This gave me the perfect excuse to make a run down there. The dive shop had a variety of dive flags and rigs. I briefly considered just buying a complete setup from them, but by the time I added everything up it would be about $60. I knew I could do better. They had a nice dive flag with a wire reinformcement for under $10. They also had a spool and a reel for about $13. Since I already had a reel I decided I could get rope cheaper at another store. OK I breafly tought about going to Wal-Mart and getting the rope, but this day was “Black Friday” and a 90 minute wait in checkout lines to save $2 on rope wasn’t that appealing to me. Yes I am cheap, but not a masochist. I decided the farm store between the dive shop and the big box retailer was my best bet for a quick visit. I found 100’ of rope for about $8. 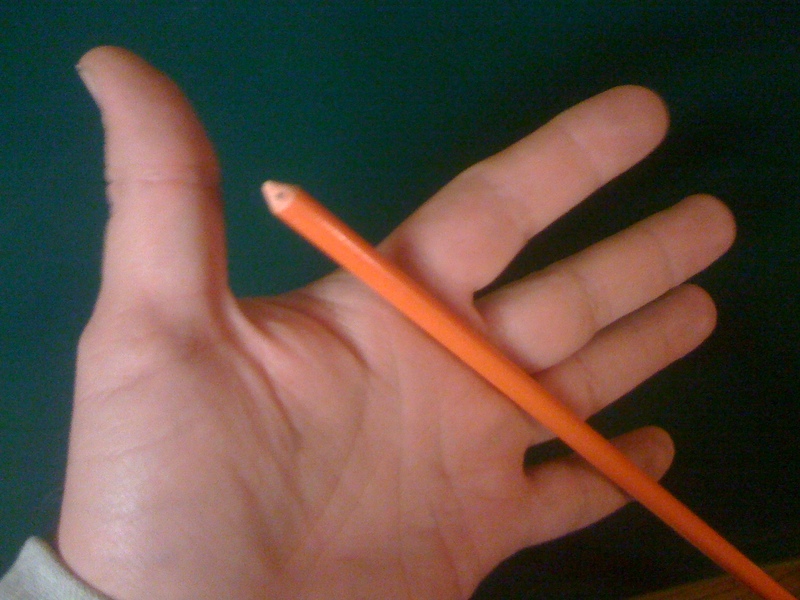 As I walked the isles I found a 6’ orange fiberglass rod used to marking the ends of driveways. I liked this much better than the electric fence post I had so that was another $6 onto the project. I looked around for something heavy to use as a weight for the rig, but my cheapness got the better of me and I left with my two goodies. I headed for home to assemble my parts before my dives the next day. The flag and the rod went together very easily. It was as if they were designed for each other. I put the reflect end down since if I slid it into the flag it would be hidden anyway. Next was the floatation part. I had originally thought I could use foam pool noodles, but I couldn’t find any. I think the dogs and decided they made good chew toys or maybe it was the cats for scratching post, but either way there wasn’t any to be found. The blue Styrofoam sheet would float but they needed to be stacked or combined. I had thought about just gluing them together and strapping that to the pole, but it just seemed sloppy. I would also be relying on glue to hold everything together or a mess of strapping. 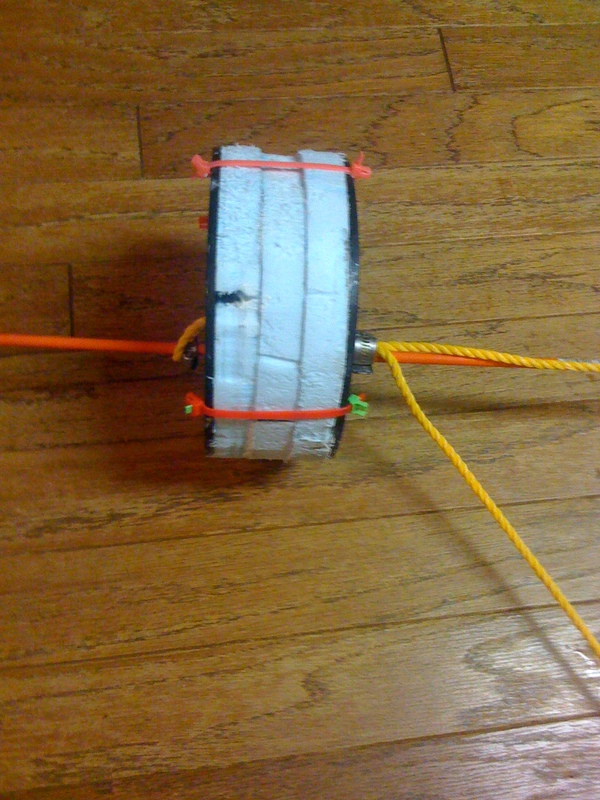 I had an empty plastic wire spool. It was just a little wider than 3 sheets of foam. I figured I could use that as a protective form. 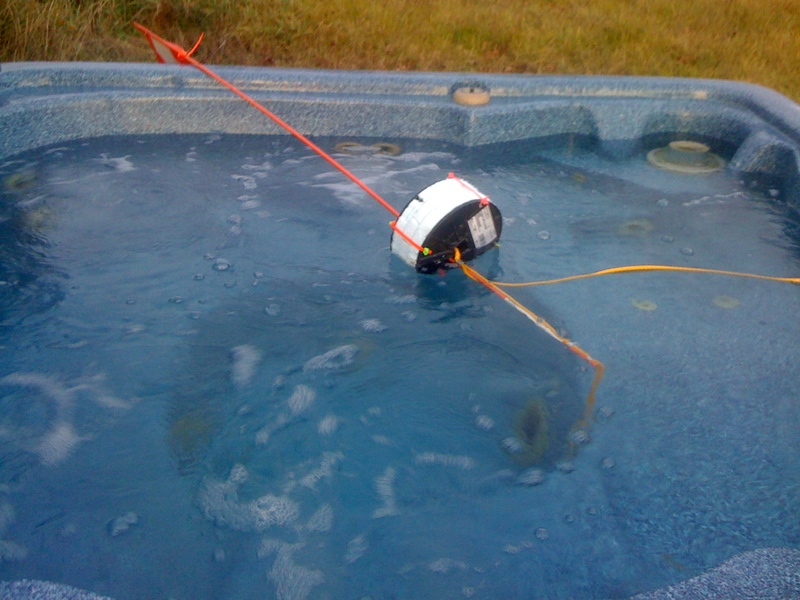 My only concerns were holding it together and would it have enough buoyancy with the plastic spool attached. I traced the outline of the spool onto the foam panels. I measured the center point and drove a nail trough it to my bench to use as a pivot point. I had a rotary cutting tool I held in place and spun the foam on the nail. In no time I had three good circles. I then cut out the centers so they would fit around the center of the spools. I then cut the foam “donuts” in half. I used some tile adhesive I had laying around and glue the foam around the spool and to each other. Then I read the instructions on the adhesive bottle “allow drying 48 hours before getting wet”. Well that wasn’t going to work for tomorrows dive. To keep everything together I used existing holds on each side of the spools to zip tie the foam in place. I drilled a hold off center on the newly foamed spool to run the rod through. The existing hold in the center of the spool was too large to easily run and secure the rod to. I pipe clam on each side of the spool on the rod would be perfect for attaching it. I held off on securing it until I finished by plan with the rope. I had 100’ of rope. I think that is really more than I needed but it is easy enough to shorten it later on. 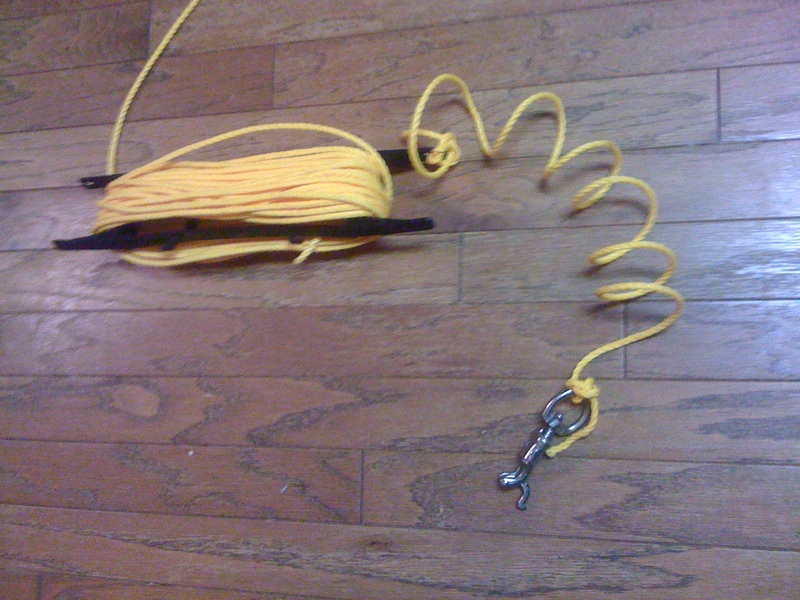 I cut a short 4’ section of rope to attach to a quick release snap on one end and tied off the other to the spool. The rest I wrapped on the spool with about 8’ to run through the float. I fed the ends through the pipe clamps around the rod and back through the pipe clamp. I had an extra pipe clam at the bottom of the rod I ran the end of the rope through. I then put a double snap on this end of the rope to attach a weight too. I had a variety of heavy objects that I would add until I had the right mix. Next it was time for a test. The hot tub seemed the perfect location to test it out. As I expected without any weight it just flopped over. Even with a couple of extra snaps attached it still wasn’t heavy enough to stand upright. I had to add a steal hook with 4 links of heavy chain to get it upright. The good news was foam was enough to float the rig. The bad news is I didn’t really like how far the hook was hanging down. This would be ok for a lake dive but for a dive starting from shore or in shallow parts of a river I was having my doubts. I didn’t like the idea that the hook would be dangling and dragging, but I figure a real life test was the only way to know for sure. 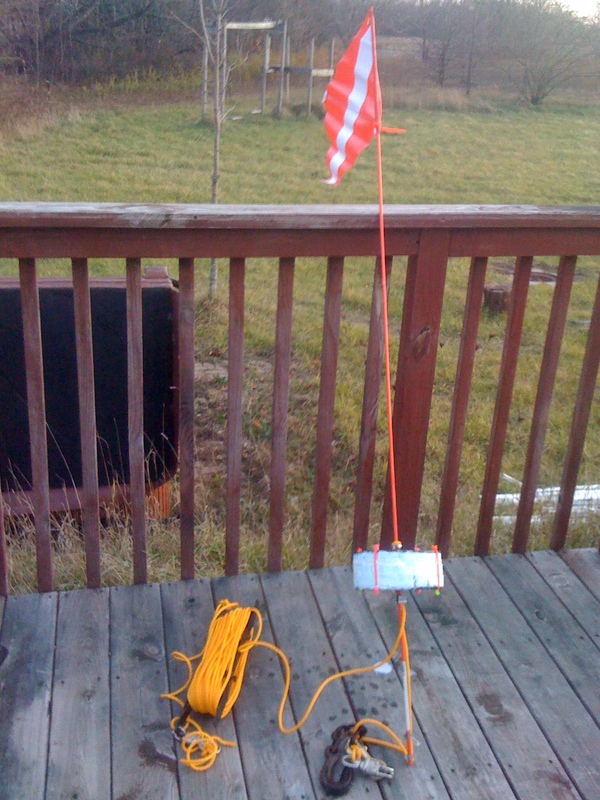 12 hours later the flag got its first test. We dove in a fast move river. I never got deeper than 10’ and most of the dive was around 5’. The flag looked fine, but was close to 45 degrees most of the dive. The hook as I expected did get caught on anything it could snag along the bottom. The second dive of the day was must deeper and the current was slower. I unfortunately for most of the dive didn’t have enough line out and wondered why it was such a drag to pull behind me. With less than 5’ of vis I didn’t realize I needed to let out a little more line. An extra 5’ did the trick. Like before coming in and out of the water the hook would snag. So what was my verdict? I think it was a success. I am going to replace the oversize steel hook with some sort of lead weight attached to the end of the flag. I will still keep a double end snap handing below. I like the idea I can attach something to it if I need to. 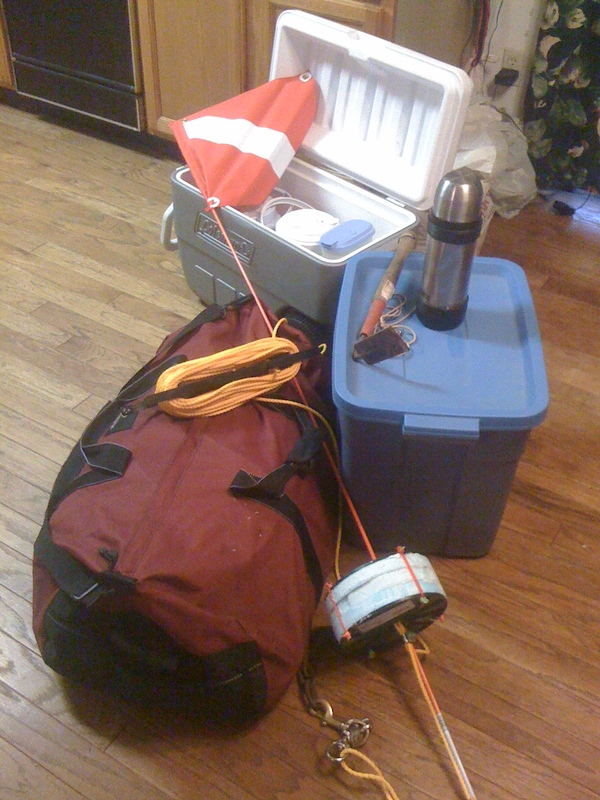 I plan to get a truck inner tube with a basket in the middle that I could attach the flag to when I do ecology dives. That will give me a spot to store some finds. Overall I think this was $20 well spent.